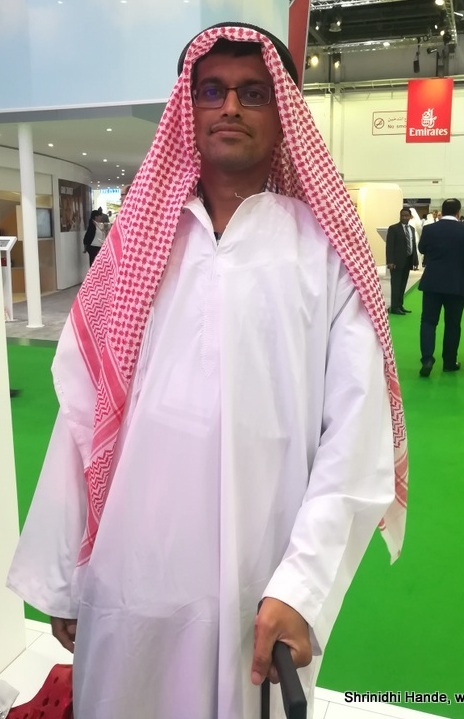 Early April, when I told a friend about my Dubai visit, Rutavi Mehta informed me about Arabian Travel Market event happening during the days of my visit. Since travel is my subject of interest, I decided to spare a day or two from my Dubai plan for visiting Arabian Travel Market, ATM for short. This post shares my experience attending this event- will be useful to bloggers considering attending ATM in future. As I began registering as a generic visitor (buyer's club) the website suggested I may qualify for media registration (as I mentioned blogger). Thus I registered as media. I was told to expect a confirmation in 3 business days. But 5 business days passed but I didn't get any confirmation. I assumed my media registration is probably denied and registered as a generic visitor. Next day both my registrations got approved. 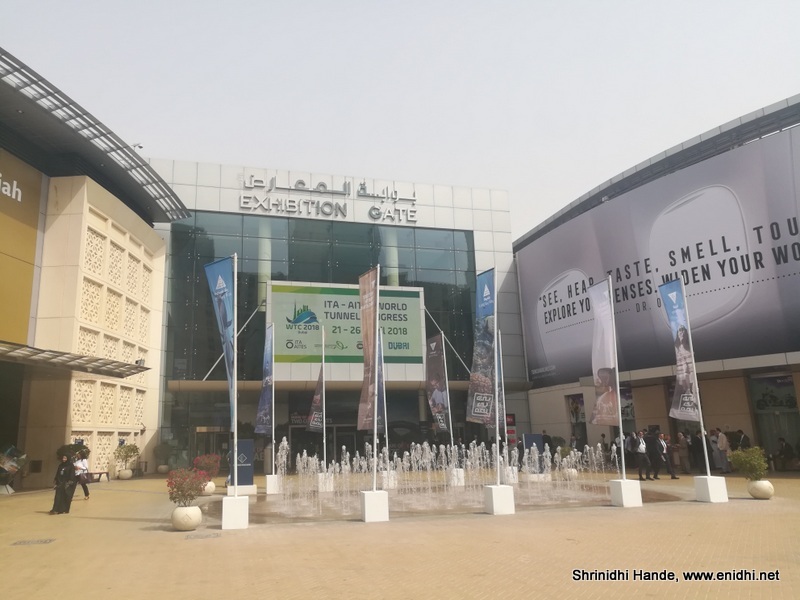 2018 marks 25th edition of Arabian Travel Market, hence was special. However it was my first visit ever to ATM so I attended the event with zero expectations. After we registered, we could sign up for some speed networking meets but I was too late- the slots were all taken. What did I gain from ATM2018? There were lots of VR sessions (Virtual Reality)- we could put the VR set on and experience things – like how it is to explore Sharjah, or some hotel or formula 1 racing other such destinations/attractions. 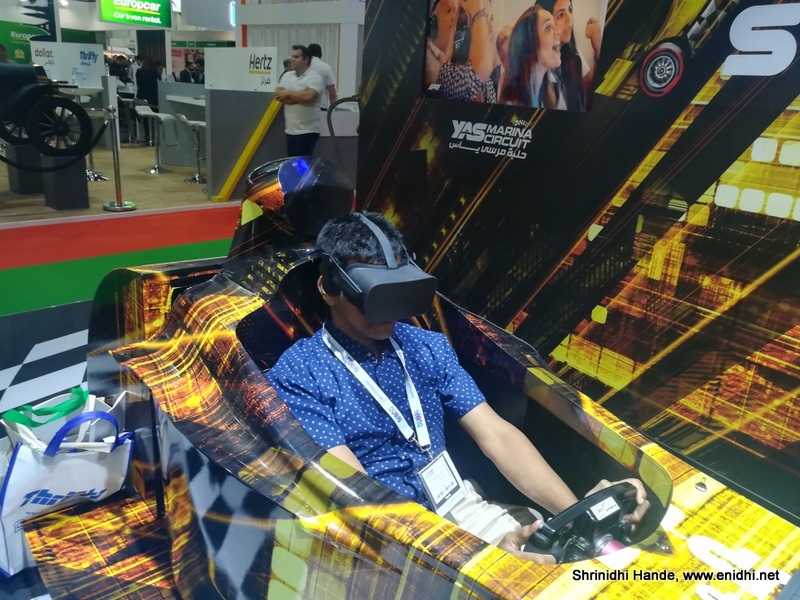 VR is nowhere close to real experience, but it is an easy and free way to experience things that are otherwise very expensive. Got good idea about various counties that had set up their booths, places to visit in them and what’s unique, new attractions coming out- this knowledge will be useful for me in future trips. I have a separate post planned to share my key findings. I had originally planned to attend a few sessions-but once inside the venue it was too overwhelming to balance exploring the stands and being at the right venue (for speaker sessions) at the right time. I did spent a few minutes listening to Finland’s ambassador to UAE and few other sessions but overall I can say I couldn’t plan well to attend the right sessions. Having a media pass entitled me to access media lounge, where I could sit and work, know more about the event or have some refreshments. Else food has to be purchased from specific food stalls or mobile carts. For selfie enthusiasts there're dozens of provisions to get some great photo clicked. I got a few, but if you go with a friend who's good with camera, you can have lot more fun. Did I get lots of contacts? No. I think I interacted with about 50 odd people and exchanged cards. But depending on how active you are, how well prepared, what exactly you're looking to buy/sell and how good is your interpersonal skills, you can do better. I attended only on 2 days- Day 01, 11.30 to 2.30 and Day 02 10 AM to 3 PM- I didn’t have anything specific to sell or offer or discuss- went around checking out various booths, trying various experiences that were on offer, photographing anything I found interesting and interacting with exhibitors where possible/where I found something to ask/converse. 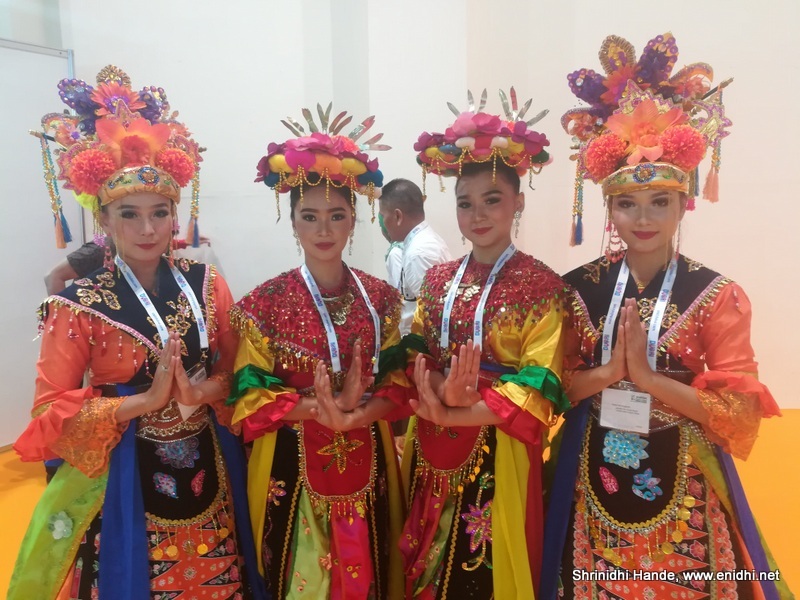 Most exhibitors were travel agents and companies- they were looking to connect with others in travel business- like agents in other countries with whom they can tie up and get some business from. Did I get lots of goodies? This was not my objective- if getting free goodies is your agenda, then you might get disappointed. Though not publicly admitted, probability of getting freebies is a major driver for many participants. 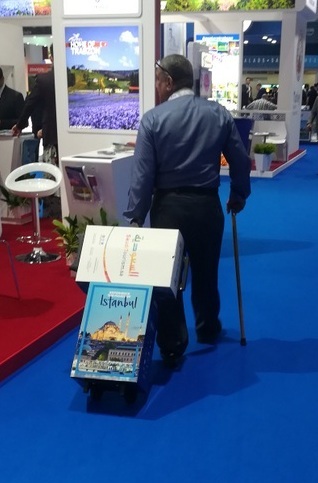 Some exhibitors like Hilton Hotel, Istanbul and Saudi Arabia were distributing this trolley bags- small cardboard box mounted on top of a trolley- very convenient to put other brochures inside and drag it along. At least a dozen people asked where "where did you get it". While most were content with one, few had collected 2 of them and were dragging it one on another. These trolleys are not very rugged- if abused, they will easily break. 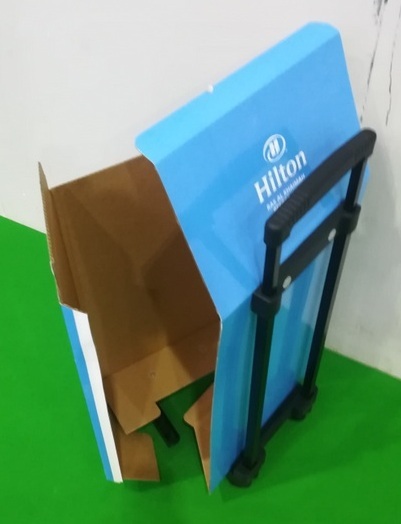 A few had to abandon their precious trolley after they failed, unable to with stand the load or abuse. I got a pen drive, few stationery items- if you're keen to know. Were exhibitors treating bloggers well or do bloggers get lots of respect at ATM? No. ATM is not an event targeted at bloggers. Exhibitors wouldn’t have come prepared to talk to bloggers. Their focus is B2B- to talk to travel agents and businesses to sign business deals and try to get more business. Working with blogger won’t be on their agenda. Yes, you can meet a few PR/Marketing folks who might be open to consider bloggers but such opportunities are few. Experience 1: An Egyptian travel company- As I was walking through an Egypt related stall, a person extended a chocolate and invited me for a conversation. He asked me “Do you know what this chocolate is made of?” Obviously I didn’t know- (No one would know unless they see and taste it- obviously this a great conversation starter tactic used by this person). I said No- he said something about the chocolate in one line and picked up a brochure to explain his business. He asked me if I am a travel agent- I said No, I am a blogger. He immediately shut the brochure and moved back, ending the conversation abruptly. This shows he didn’t see any value in wasting his time on a blogger. Experience 2: Warner brothers PR- As I was having some refreshments in the media room, 2 women came to me, introducing themselves from Warner Brothers company and asking if I am free to interview their Director, who is in the stall and is free till evening. Warner Brothers are opening a new attraction in Abu Dabhi hence need some publicity for this new launch. We exchanged cards, I said we can meet him after sometime and I can do an interview. A few minutes later, I asked them if the director is available, the statement was “No, he is busy now and then he is leaving”. My guess is they checked my blog and figured out I am not worth the time of their top boss. May be what they said was true, but I saw them speaking to other media people- so my guess is they are looking for a more qualified/eligible/credible journalist than a low profile blogger from India. I don’t blame them or hold any grudge-they are doing their job, so I am cool with it- as such I wasn’t big expert in entertainment industry and it saved me the trouble of preparing for the interview. Experience 3: Free Desert Safari that didn't happen- I saw an Ad on facebook, that offered free desert safari to bloggers attending ATM. I promptly applied for the same. I got a mail asking for basic details, to which I replied. Next I got an email, saying "Now all you've to do is promote our link"- I didn't understand this bit- I was happy to write about the desert safari experience after the experience, I was willing to buy an extra ticket for a companion who isn't a blogger. But I never got my pass. I think their expectation was that we should write about desert safari first and promote their company to get the pass- my thought was let me experience the safari first and then write about it-as a result of this conflict of expectations, I didn't get the free safari. Arabian Travel Mart had a few sessions around influencer marketing. Unfortunately I couldn't attend the same- such sessions will be useful for travel bloggers. There’re other events more exclusive/targeted towards travel bloggers- TBEX, TBCAsia and so on- attend them if you’re looking to grow/get opportunities as a travel blogger. ATM will give you lots of information about the travel industry, latest offerings, new destinations that can be explored and so on which you can use as a blogger or use for planning your next trip, but don’t expect lots of opportunities (such as free trips or goodies or high value contacts etc) to come your way. Of course, a lot depends on how you plan your visit to ATM and execute your plan- like if you go with specific offerings, can afford to spend lots of time and engage cleverly with prospects then you will have better chance of success. I am not the most charming, interactive person, so don’t take my experience as a benchmark- whatever I have written here is only to give you an idea. Actual experience may vary from person to person. How was the event management/coordination at ATM 2018? I would say very good, in comparison to what I have experienced in India. Registration process was well defined. Event management was great, arrangements were decent. Day 02 I went in at 9.50- there was an announcement for maintenance/cleaning staff to vacate the hall as show would begin soon. Entry to each hall, each press meet/talk etc were monitored by scanning access cards- so event organizers now know who attended for how many days, which specific areas/events etc. This goldmine of data can be used for better planning and marketing next time..
Do some research on the exhibitors have some conversation triggers- like "What is the best season to visit your country" or "How many days at the minimum is needed to explore most interesting destinations in your country" etc. It will be awkward to go to a stall but not knowing what to speak. Don't go expecting lots of goodies. If you get something then great, but winning free stuff is a function of luck (being at the right spot at the right time), how the other person perceives you and so on. Having customized business cards, attending right sessions, using speed networking sessions etc will make lots of difference. Will I visit next year? Where to stay if visiting ATM? IBIS hotel is right next to world trade centre where ATM happens. If you want convenience, you can book the IBIS hotel. Otherwise any hotel close to a metro stop is good enough. Venue of ATM is walking distance from world trade centre metro station, you can reach here via metro from any part of Dubai. Lots of luxury hotels are located right on Sheik Zyed road, budget hotels will be a bit away around Old Dubai area. Upon your registration you will get some unsolicited emails offering discounted hotels- you can check if they are worth. I recommend visiting on at least 2 of the 4-5 days the Arabian Travel Market event happens. When I visited during opening hours of Day 01, most stalls were not yet fully ready- senior people hadn’t arrived yet, junior staff were preparing the brochures n stuff. Some stalls will be conducting games n experiences which you may not spot in one visit. Revisiting again might ensure you will get to see what was missed earlier. Also check the event schedule- different sessions are planned on different days- you can plan to attend on the days having sessions of your interest. Never been to ATM and I am same, can't do much talking at B2B events! But what a comprehensive post and nice tips. Never been to an ATM but wanted to know the details which you have compiled so well. I had heard it's a best place to get contacts and grab deals. Well, whoever said might be joking. Thanks for dropping by my blog! I am glad I found this post very different from my blog. I was interested reading this post fully. Looks like this is a nice experience to learn from. Open and honest when it comes to what it is like to be a blogger! Happy May! Wonderful post. Would love to attend the event. I agree with you that one must be expected to write about a safari experience after experiencing it! Perhaps, they wanted to ensure that people wrote about the safari before gifting the free safari pass. Even if one did write and promote prior to the safari experience, what is the guarantee that one would earn the pass considering that the number of such free passes would be limited?